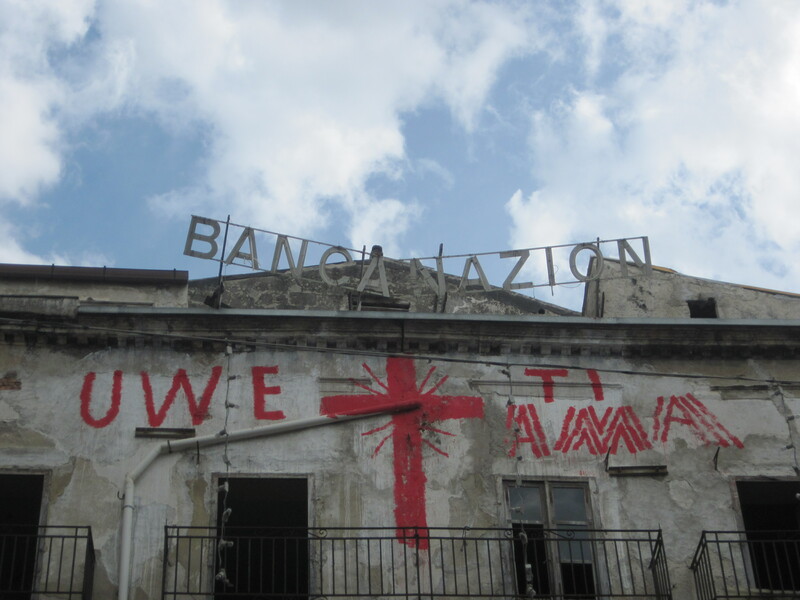 It has been one year since the destruction of Banca Nazion, an installation work of art made by Uwe Jaentsch, an Austrian artist who has been living and working in the Vucciria market of Palermo since 1999. 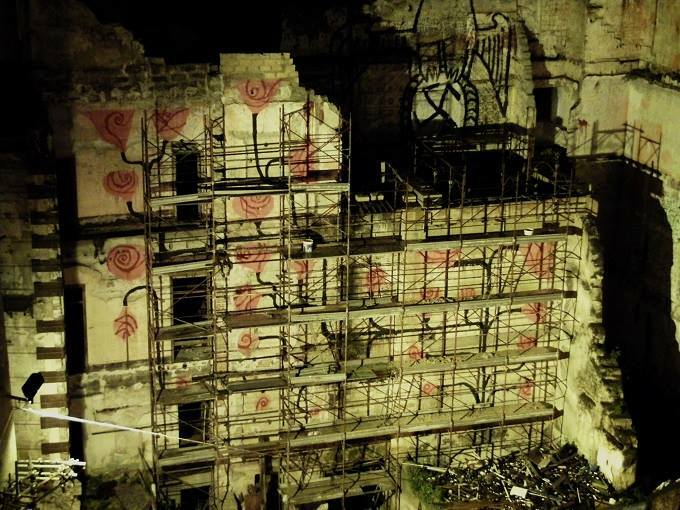 After a year, another destruction happened again like a karmic cycle: we are talking about the roses painted by Uwe on what still remains of the ancient Loggia dei Catalani. But what happened during this year? On February 5, 2014 a portion of the Loggia dei Catalani (Lodge of Catalans) collapsed, because of the condition of neglect and decay of the building, a sad condition whose origins have been lost in the mists of time. 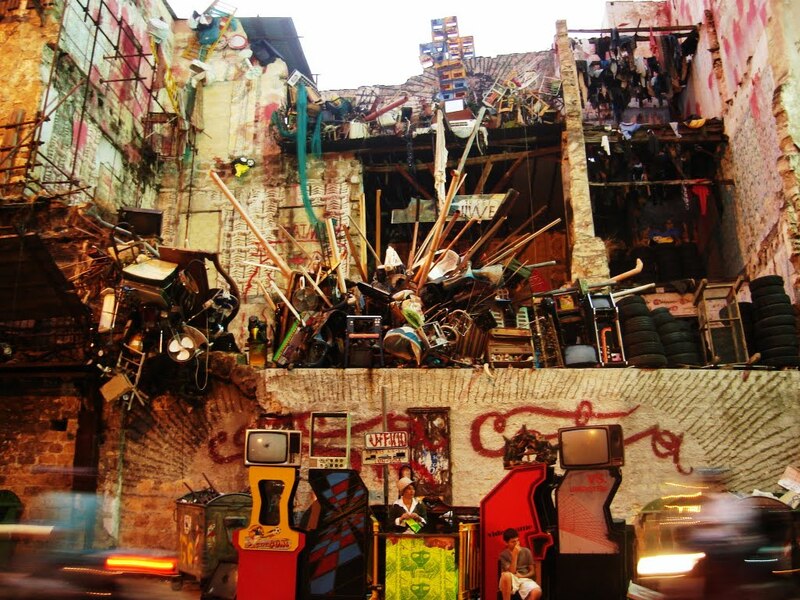 In 2006, Uwe created the Cattedrale dei rifiuti (Cathedral of rubbish), a giant installation created in the gutted rooms of the Lodge, a work of Land Art in its best sense: the canvas consists of space, in this case an urban space; the work is for everyone and created by all, because local residents had an active role helping the artist and his collaborator Constance Lanza di Scalea with donating their own meaningful piece of junk. Where the negligence of the Municipality was ruling and while lots of money were invested for other urban areas, Uwe made his contribution to the bowels of Palermo, still pulsing with life, despite decay. Actually it is hard to conceive an action such worthy of respect and regard: it reveals Uwe’s unfading love for the Vucciria, even if this place is crumbling; the poetic belief that, in order to give new life and art to this place, the billions of the European Union are not required, but instead even scrap, garbage, can make tribute to the decadent beauty of the Lodge. It should also be underlined the freedom and the genuine democracy of an art like this, which escapes from places typically devoted to artistic creation, such as museums and events created by the rich for the rich, but which instead it is offered free to all and that is easily understood by everyone. But the Cathedral of rubbish has been dismantled by order of the municipality. 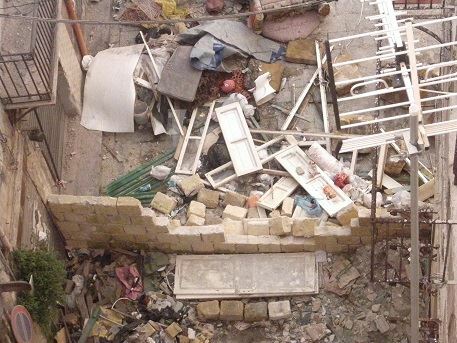 The Lodge’s decomposition went on and on and on in an overall disregard until, after the collapse of 5 February 2014, the Municipality of Palermo, acting under the authority of Leoluca Orlando, finally decided to take action and, with the usual sense of humor that distinguishes it, acts immediately in the opposite building, Mazzarino Palace. Here, the Municipality is getting ready to dismantling in a hurry another Uwe’s installation: Banca Nazion, later rebuilt by the artist. 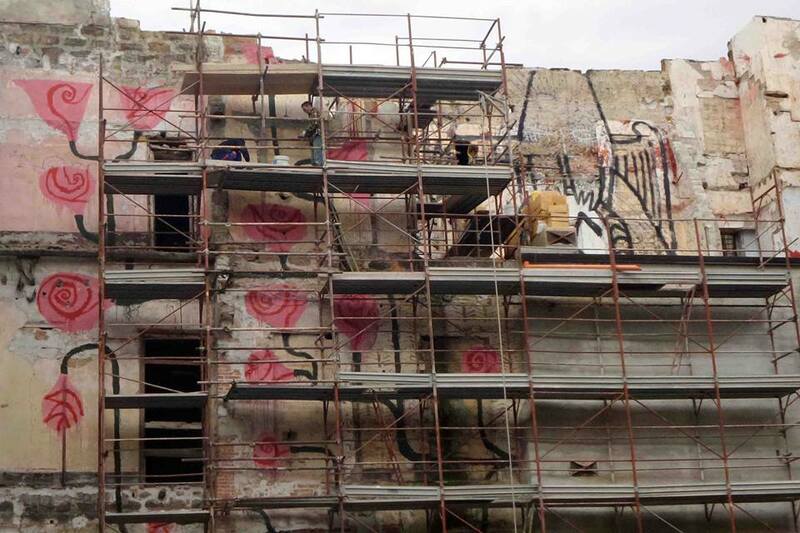 In short, it would seem as if the main problem of the Municipality of Palermo doesn’t consist in retrieving the historical center of the city (the Vucciria district), as a place of immense value, but in destroying the artistic complaints made by Uwe. Therefore it is a matter of urgency to keep silent the mouth of that pesky kid who insists on shouting about the naked truth of the emperor’s new clothes. Since then, what happened to the Vucciria is there for all to see: the wonderful Mazzarino palace, dating back to 1500, has been renovated with brutal reinforced concrete and the same sad thing happened to the other ancient buildings of Garraffello Square, one of the major square of Vucciria. The Municipality achieved a goal that even the bombings of the World War II had failed: stealing charm and energy to such a powerful surreal place like Garraffello square. We already know about the ridiculous solution to surround the square with walls later torn down by citizens themselves. 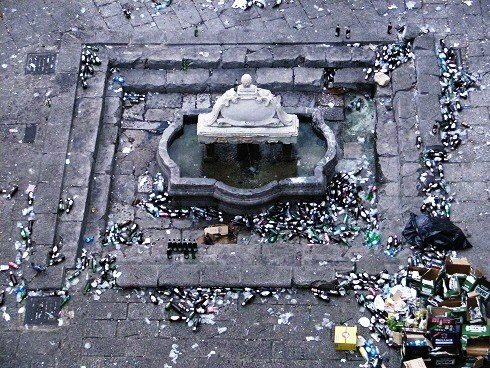 In addition, the Fontana della Pigna (fountain of the pinecone), placed at the center of the square, has been the focus of many issues. For several months Uwe has been documenting with many photos the horrifying state and the shameful decay of the Fountain (dating 16th century). Two photos are shown here as an example. 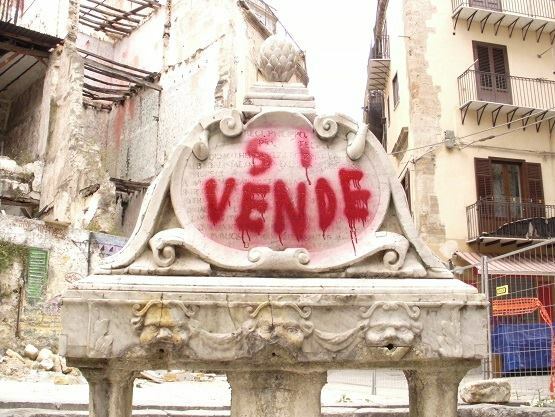 In May 2014 a sarcastic red writing appeared on the Fontana della Pigna: Si vende (On sale). But again, in homage to the tradition of the emperor’s new clothes, it is Uwe the only one who must pay, thanks to a nice legal complaint against him for the writing, although the written words has been eliminated by the artist without any harm to the Fountain. Here’s what is happening now, in February 2015. 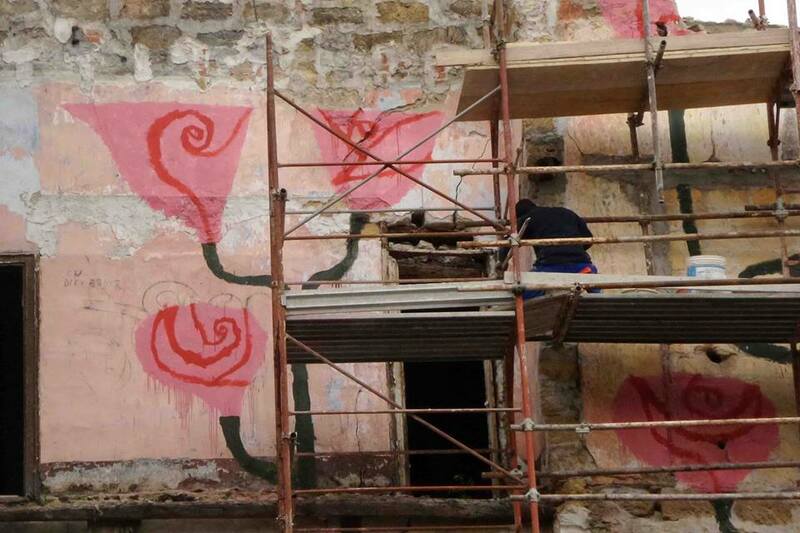 Uwe strike again, but this time in a quite different manner: he has painted 25 roses on the Lodge of Catalans and we can see them in this picture taken by Uwe himself.Title of the work is La bellezza dell’abusivismo (the beauty of abusiveness). The following photos show what still remains of the roses. I said that this work is very different compared to the others of the same artist and the reason lies in the moving idea of this action. Uwe was fully aware of the fact that the roses would have been covered by the least poetic avalanche of reinforced concrete used in order to restore the ancient Lodge. Nevertheless, Uwe has dedicated his time and his action painting them. An extreme declaration of love for the Vucciria and for the Lodge. A statement that reminds the one he had expressed in capital letters on the Mazzarino palace: Uwe ti ama (Uwe loves you), but this time it is an utmost declaration because of the awareness of its upcoming death, and for this reason it is even stronger. Tag: Banca Nazion, bellezza dell’abusivismo, Cathedral of rubbish, Cattedrale dei rifiuti, Fontana della Pigna, fountain of the pinecone, Garraffello Square, Lodge of Catalans, Loggia dei Catalani, Mazzarino Palace, the beauty of abusiveness, Uwe Jaentsch, Uwe loves you, Uwe on sale, Uwe ti ama, Vucciria market of Palermo. Aggiungi il permalink ai segnalibri.